The company says that the bottle can be used during outdoors hiking or camping and during natural disasters. 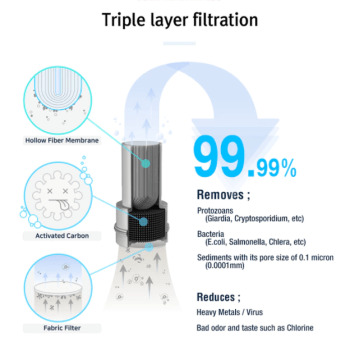 Three layers of filtration can theoretically remove 99.99% of contaminants from water. Giardia and cryptosporidium protozoa, e.coli, salmonella, cholera, and sediment with a pore size down to 0.1 microns can all be removed by the filter. Odor, chlorine tastes, heavy metals and viruses can all be reduced by the system but not removed. Purisoo says that sea water and water with poison or agricultural pesticides and chemicals cannot be filtered by this system. A hollow fiber membrane, activated carbon layer, and fabric filter all work together to purify the water pumped into the bottle. 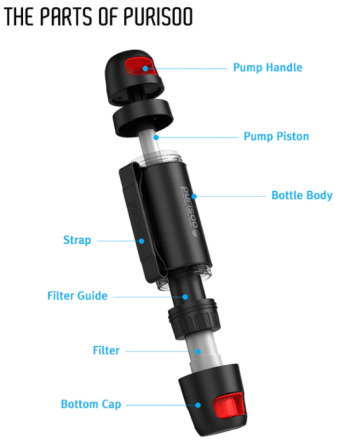 When pumping water users can either place the pump end of the bottle into the water or detach the intake valve with the 1 meter hose into the water. The user takes off the pump handle end and drinks filtered water from the reservoir. The bottle has a 3 inch diameter and is 11 inches long, weighing 20 ounces and holding 410 milliliters of water. The filter is spec’d for 1000 liters of water and operating temperatures are recommended between 0 and 50 degrees Celsius. The Purisoo bottle joins a crowded field of water purifiers and addresses some issues that I’ve heard about the current products. There’s not a lot of hard data about the testing or longevity of the system but there’s a demonstration video showing dirty water filtered into clean water and a few demonstration videos of the pump being used at water sources. The Kickstarter page says that the project is in its prototype tooling and testing phases. The campaign has met its funding goal and will end on April 18, 2018 and the current posted shipping date for the bottles is July 2018 – three months for production tooling molds, assembly and testing seems very ambitious to me.